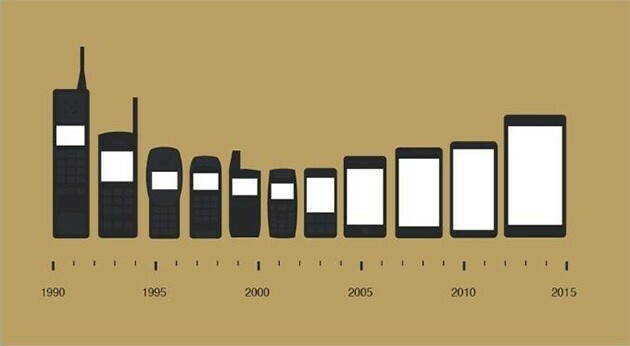 Don’t let the rate at which smartphones have grown since the early years of this millennium fool you. The future of electronic products is to get smaller and smaller. And these smaller devices will offer ever greater capabilities while using less power. Smartphones’ growth in size belies this trend, but it’s a reflection of the fact that they have taken on the role of so many other devices. It’s the need for a bigger screen that has led to their burgeoning size. But look how slim they have become as their screen size grows. Consumers want smaller gadgets that can do more – and do it quickly. So, the smartphone has become a pager, powerful camera, video recording and editing device, media player, sat nav, eBook reader, personal organiser, word processing tool, games machine, credit card, scanner and a lot more besides. The journey towards miniaturisation is being aided by advances in screen and battery technologies, but sitting right there in the driver’s seat are developments in components and circuits. And it’s not just consumer goods that are getting smaller and smaller – this trend extends to industrial technology too. Wherever you look less is more, and this is known as Moore’s Law. Moore’s Law has held true for nearly 40 years now. In truth, it’s more an observation than a law. It suggests that electronic devices will double in speed and capability about every two years. And transistors are the tiny electrical switches that lie at the heart of any electronic gadgets you can think of. As they shrink they also get faster and consume less electricity. It’s not just transistors that are shrinking, however. The humble capacitor was once, in the 1970s, made from bulky axial leaded parts. These were replaced by the slimline 1206 ‘surface mount chip package’ which, at the time, appeared to be an impossibly microscopic 3.2 x 1.6 mm. But now we have 01005 packages, offering a further volume reduction of 98.5% and measuring just 0.4 x 0.2 mm! Similarly, it wasn’t all that long ago that the tiny 60 x 60 mm IC (silicon chip) device, with 160 connection pins around the outer perimeter, was considered cutting-edge. Yet, its equivalent is now the 30 x 30 mm ‘micro-ball grid array’. This sits on a matrix of 900 solder sphere connections – and requires the use of an X-ray to fully inspect. In recent years many have wondered if Moore’s Law is coming to an end, as components meet the limits of possible shrinkage. Companies like Intel can mass-produce transistors 14 nanometres across – that’s just 14 times wider than a DNA molecule. They’re made of silicon whose atomic size is about 0.2 nanometers. With transistors hovering at about 70 silicon atoms wide, the possibility of making them even smaller is starting to shrink. We’re getting very close to the limit of miniaturisation. We’ll return to this in a moment – first, let’s take a look at why small is considered so beautiful. Aesthetic demandsWe have come to expect our tech devices to be design-statements and things of exquisite beauty. Our wireless devices should be easy to take with us. Light weight devices are enabled by the miniaturisation of components and PCBs, reduction in battery sizes and developments in plastics and metalwork. Cost savingsWhile cutting-edge miniaturisation can come at a premium, the use of less materials usually provides a reduction in cost in the long-term. Especially when the electronics industry absorbs and adopts innovations and the production costs for increasingly smaller parts shrinks correspondingly. Eco-friendly power consumption reductionsSmaller parts use less power. This reduces running costs, extends battery life and offers greener products. Less heat dissipationAs smaller parts consume less power, they lead to electronic products which generates less heat. When heat dissipation requirements are sufficiently reduced this can avoid the need for bulky heatsinks and mechanical fans. This, in turn, further reduces weight, cost, power consumption and intrusive noise. What impact have smaller components had on electronic manufacturing? From an EMS and product manufacturing perspective, perhaps the most significant impact of this reduction in scale is the increased need for automation and use of robots. The sophisticated soldering technologies now required to fit components and parts is no longer possible by hand. The precision required can only be carried out using high-tech equipment operated by skilled engineers. It’s not just production that has become increasingly automated. With components getting smaller and smaller they become, to the naked eye, identical. Many components no longer have any space to carry distinguishing codes or other markings to aid identification. It has never been more important that your EMS partner can offer you a fully traceable and trackable supply chain and uses barcodes and sophisticated machines to inspect, select and verify (as well as place) every component used. Robust materials control is essential at every step of the supply and manufacturing process. Are our shrinking days no Moore? Many industry commentators have suggested in recent years that the gains we have enjoyed under the rule of Moore’s Law may be coming to an end. Of course, we all believed things couldn’t get any smaller many times in the past. What’s different today is that we really are reaching the point where physical components are constrained by the demands of matter. For transistors research is underway that looks to replace the role of electrons with photons – this would allow light to be the medium that makes things happen.Photons are much faster than electrons and could let devices like computers could operate at 20 times their current speed.It is estimated that this acceleration would take 15 years to achieve if we relied on our current technology. Other research could soon allow the mass production of circuits on an atomic scale. This would open the door to a new generation of faster, smaller and greener electronic devices. A team led by Robert Wolkow had long-known how to reduce circuitry to an atomic scale, but they have only recently found a way to perfect a technique that allows these circuits to be mass produced. They suggest that this breakthrough could help manufacture smartphones that operate for months between charges and computers that run a hundred times faster but use a thousand times less power. It looks like it may still become a smaller world after all.